While seam sergers can feel like more trouble than they are actually worth, many of the problems you may experience while sewing with a serger can be eliminated with the proper adjustment of the thread tension. Things can be made a lot easier using a four-colored testing method as well, but you can still troubleshoot thread tension with a single color of thread across all four tension dials. The best place to start would be your serger’s instruction manual, because every serger is different, but these tips can help solve generic issues with your seam serger and thread tension. Thread your machine with four separate colors of thread. This will help you to determine the origin of the thread so there is no guessing involved. Next you need to locate your tension dials. This is usually on the front of the machine, or if you have an electronic serger, it would appear in the LCD display. The dials need to be turned to the right to tighten and to the left for a looser thread tension. Run a piece of test fabric through the newly threaded machine to test the tension. Examine the sewing to see which threads need to be adjusted. If you are seeing loose stitches at the top of the fabric, decrease tension to the closest lower number on your tension dial. If the stitches on the underside of the fabric are loose, try increasing the tension on those threads to the next highest number. When adjusting tension, take it one wheel at a time and make small adjustments before running your test fabric again. Check for catching threads in the thread guide or else ensure that there is no dirt or debris caught somewhere in your machine, re-threading if necessary. 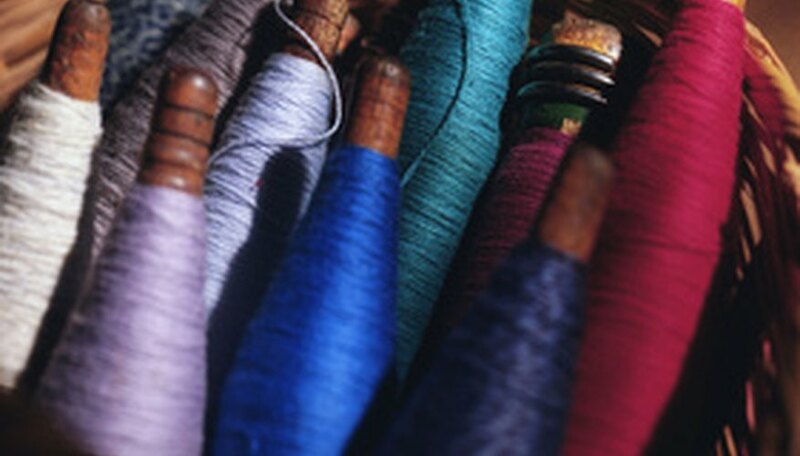 Other possible causes of loose or uneven stitches can be the quality of fabric or thread that you are using. Cheap fabric or thread may cause your stitches to pucker or become loose while you serge. Poppy Balfour began writing in 2005. Her work has been published in "Rue Morgue Magazine" and "Revue Magazine." While she enjoys writing about new media and technology, entertainment and nature, her true passion is for books and the publishing industry. Balfour holds a Bachelor of Arts in philosophy from York University in Toronto, Canada.